I consider myself to be a pretty organized person, so I tried to take myself back to the basics. What is it that I do in my day-to-day life that helps me stay organized? The answer? Systems & routines. 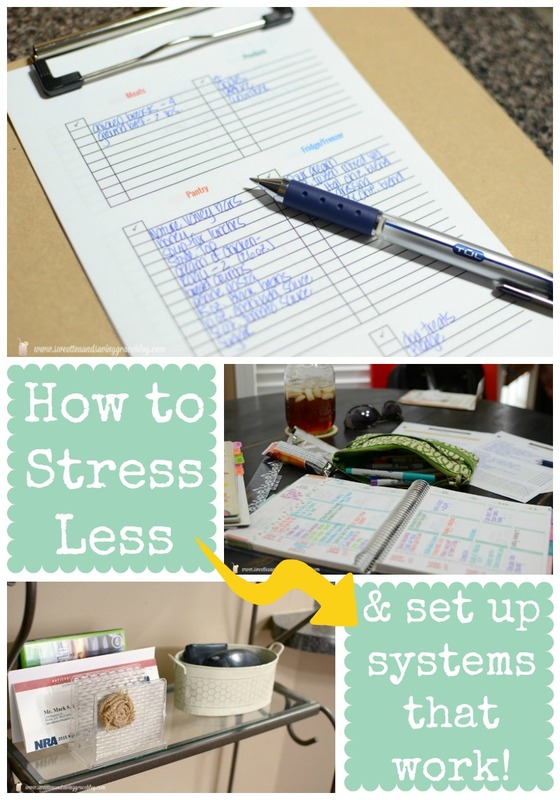 So today, I want to show you how to stress less & set up systems that work. I depend on routines and organizational systems to function. I juggle a full-time job that keeps me away from home 12 hours each day during the week, plus I’m a full-time wife & mom, and a full-time blogger, so I would absolutely lose my mind if I didn’t create systems and stick to them. Now, everyone’s life is different, every family is different, so all I can do is show you what I do and hope it inspires you to create your own methods. But I can promise you that, once you find a routine that works for your family, you’ll wonder why you didn’t do it sooner! 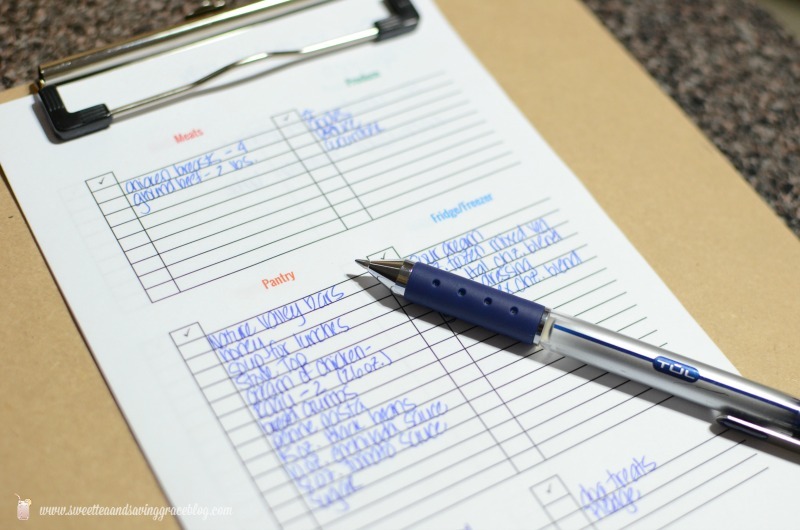 I have shared my method for meal planning for a month at a time and I still do it. It saves my sanity and my budget, and takes the guess work out of dinner plans during our busy weekdays. I recently tweaked my monthly meal plan a bit, however, to give me more time to work on my “second job” in the evenings, which is this blog & my virtual assistance services. – If you have kids who are able to cook, assign specific days and let go of the control. I stress the “letting go” part because it’s sometimes the hardest part. Don’t hover in the kitchen, don’t try to clean up behind them, or jump in and take over. Just let them cook, and take care of other responsibilities in that extra time you’ve been given. I have given my almost-teenage daughter and my husband assigned nights to be in charge of dinner. The meals are planned and the recipes are on the fridge – all they have to do is cook! – Be realistic with your meal planning. I know we’d all like to think we’ll cook a home-cooked meal every single night, and it’ll be the perfect balance of protein and vegetables, but if you’re busy with life, that isn’t the case. And you know what? That’s OK! I plan for 4 meals each week – 2 that I cook, 1 that my daughter & my husband rotate, and 1 that is a slow cooker meal. Weekends, we’re on our own. – I added one night of “leftovers” to each week. Our trash pick-up is every Friday, so Thursday nights are now “leftovers nights” in which we eat whatever is left in the fridge and trash the rest in time for trash pick-up. No rotten food, and a nice, clean fridge ready to be filled for the next week! I made a printable grocery list for you. Click the image above to open the printable. Print out two to a page, cut in half, and start making your list! I know a lot of printable grocery lists break things down into a lot more categories, but that’s just not my style. Meat, Produce, Pantry, Fridge/Freezer, and Other – that’s it. Easy peasy! Clip it to a clipboard, along with a pen, and place it where you can easily add to it. Quick Tip: Pick one day each week that will be your official grocery shopping day and stick to it. Make it a habit and just get it done. * Plan & lay out my outfits for work for the entire week. * Finish any chores – laundry, dishes, etc. The point of a prep day is to set up your week so you don’t have to stress out during the week or rush around getting things done. – Kid’s lunches: Can you prep anything ahead of time? Bag snacks, cut fruit, make sandwiches. – Backpacks, purses, gym bags, etc: Get them packed & by the door. Or better yet, put them in the car the night before. – Meal prep: Maybe you want to go ahead and brown the ground beef, bake the chicken, or cut veggies for meals during the week. Do it! – Mail, bills, checks to write: Kids need money for a field trip? Bills need to be paid online, or checks in the mail? Get it done on your prep day. 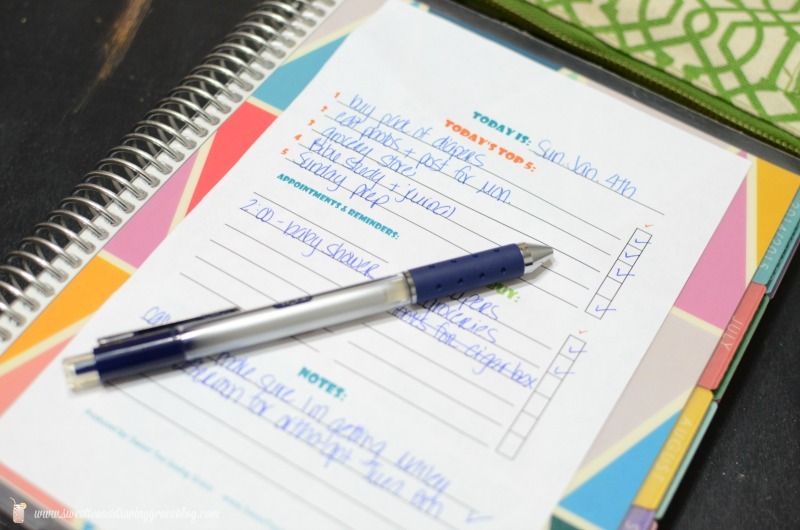 You’ll stress less during the week with a prep day to set your week off on the right foot. Incoming mail, school papers, and other paperwork can quickly clutter your countertop & your mind, causing unneccesary stress. 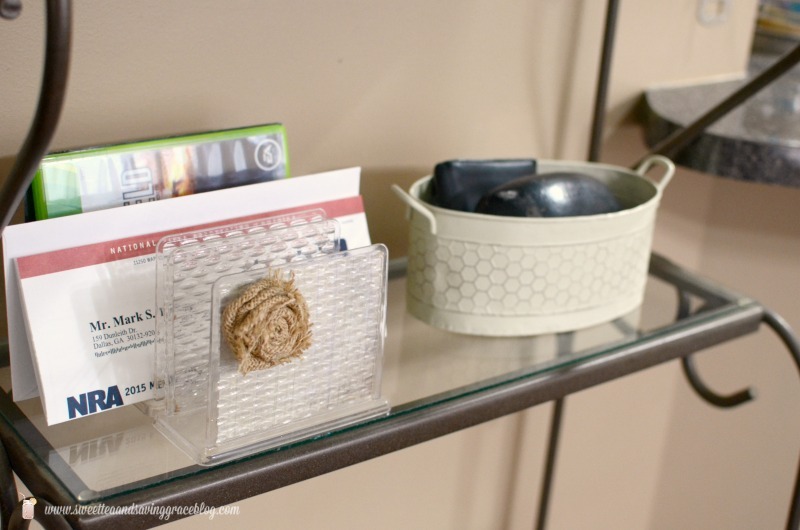 By creating a designated area for all of that incoming paperwork, you’ll make things so much easier on yourself. 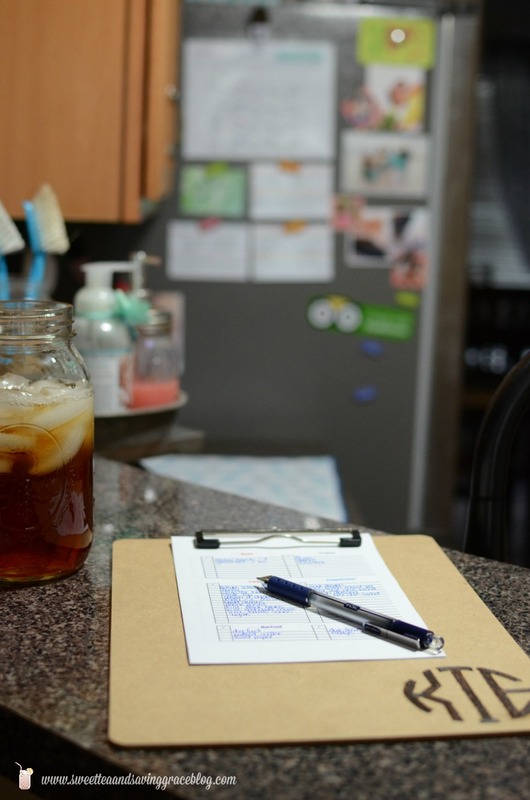 * Pick a prominent location for all incoming paperwork – ours is on the baker’s rack right next to the kitchen counter. * Make sure the family knows that THAT is where incoming papers go, and to use it. * Decide who is in charge of sorting. If it’s you, do it immediately, and only touch it once. Several years ago, I read in a magazine that one trick to curbing the mail beast is to only touch it once. I’ve been using that same tip ever since. When mail, or school papers, or any other paperwork comes in, as you go through it, decide it’s fate. School papers need to be signed? 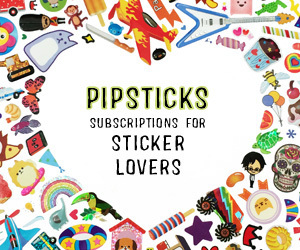 Sign them, then hand them back to your child or put in their backpack. Done. A bill comes in the mail? Schedule the online payment or file with your bill pay system. Done. Junk mail? Toss in the recycle bin. Done. 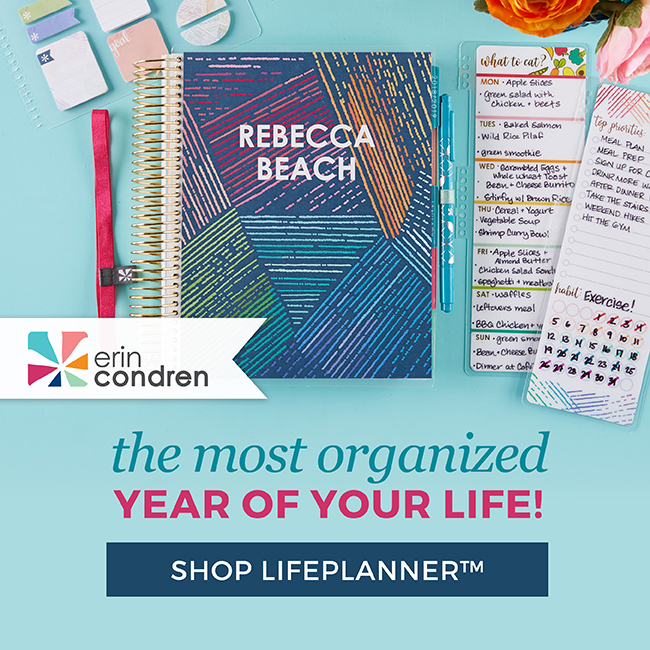 I’m a paper planner girl, and it’s no secret that I love (and live by) my Erin Condren Life Planner. Being a blogger, I also have a blog planner that I got from Mama Miss. On Sunday Prep Day, as I mentioned earlier, I sync these two planners. Your events & planners will look a bit different, but the process of syncing them can be similar. 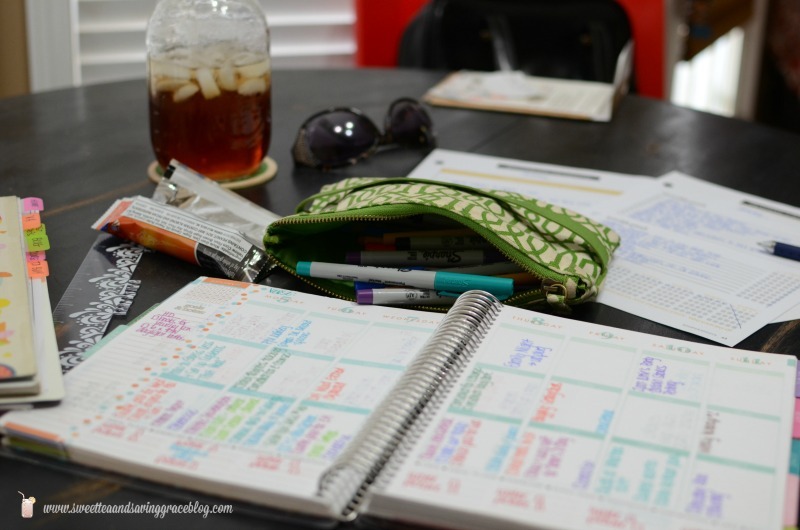 I like to spread everything out on my kitchen table – my blog planner, my Life Planner, my tending list for the month ahead (this is from my Lara Casey Powersheets to help me work towards my goals), and my colored pens, and I sync everything for the week ahead. Everything I need to do in that week goes in my Life Planner, and I check it off as I get it done. * First, I add in any personal appointments or reminders. Marley’s orthodontist appointment on Tuesday is in there, as is a reminder to put trash out by the curb Thursday night, and a birthday party on Saturday. I made sure to add “buy a birthday gift” on my list of to-do’s for the week as well. * Then, I add my personal goals from my tending list. 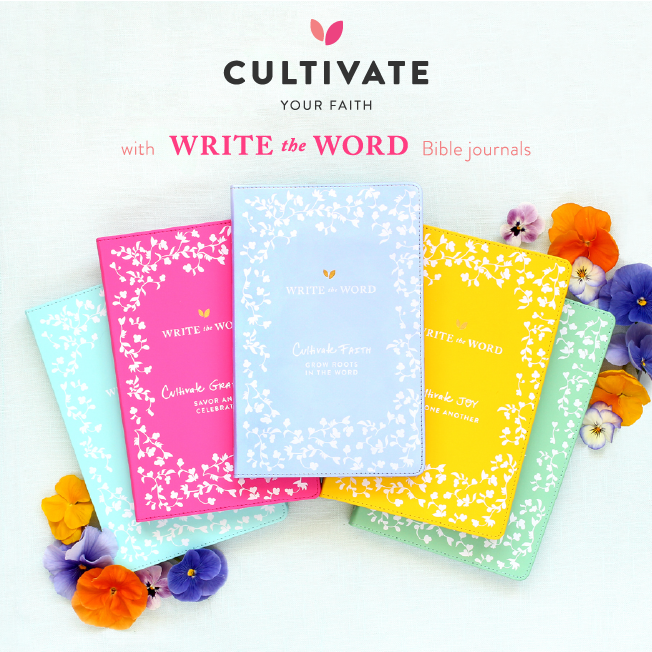 My goals this week are to do Bible study & journaling 3 days each week, so I added those to Sunday, Tuesday, and Thursday nights. I also want to work out 3 days, so Monday, Wednesday, and Friday, I put exercise in my planner. I also scheduled in tasks that will help me work towards my blog goals. * Finally, I added blog to-do’s, like supplies for upcoming projects that I need to buy, photos I need to take, etc. 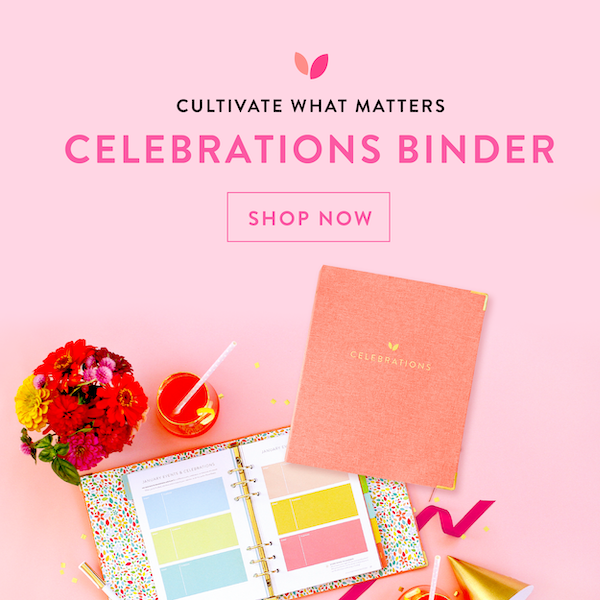 When syncing your planner, you might need to add in your child’s school calendar of events, job functions, bills that are due to be paid, etc. There are certain things that I do everyday, and they’ve become routine for me. (See? I even have systems for each day!) Sometimes there are things that need to get done, but I really don’t feel like doing them, so they might get pushed aside, then I get stressed because I have to rush to get it done. Now, I make my Top 5 for the day. These things are those items that, no matter what else I do that day, these 5 things WILL get done. I made another printable for you to tackle your daily to-do list and keep that Top 5 in view so you can make it happen. To print the half page version, click HERE. If you would like a full page version, click HERE. This might be something you do at the end of each day. It’s a great tool for clearing your mind of what needs to be done the next day so you can stress less & sleep better. Add your Top 5 for the day and feel awesome when you get them all checked off. Add any appointments, items to buy, and other notes, then let go of the stress. Those are my systems. I want to leave you with a little message, though. Please do not feel overwhelmed and try to implement too many new systems at once. You’ll burn out, just like when you try to jump into a new diet & exercise routine too quickly. Maybe pick one area that needs the most work and come up with a system to try for a week. Try it, tweak it, and make it work for you. Once that has become a habit, create a system for the next most important area. What systems do you have to help you stress less?